Turkey burgers are one of our staple dinners. I’ve posted the recipe before. In my opinion turkey burgers are better than ground beef burgers. They feel lighter and healthier too. 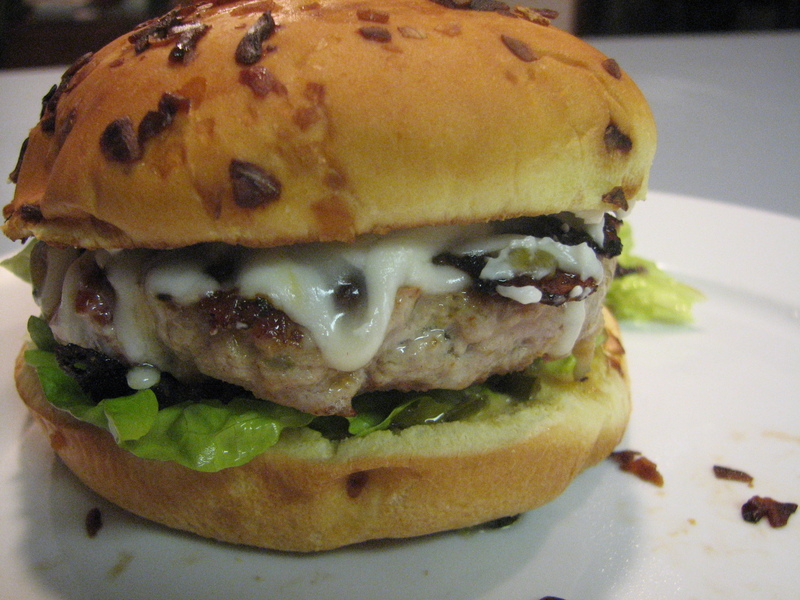 One of the great things about making our own turkey burgers is that we can do any kind of variation we want. We’ve done chopped black olives and feta burgers. Jalapeno and Colby Jack cheese. 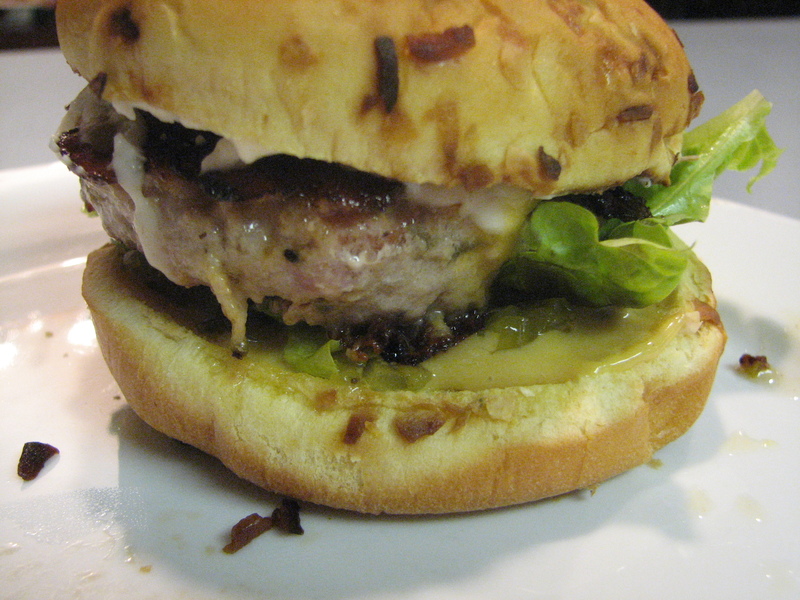 Well last night we tried a brand new variation: Bacon and jalapenos. Michael followed the recipe base and then started adding the variations. 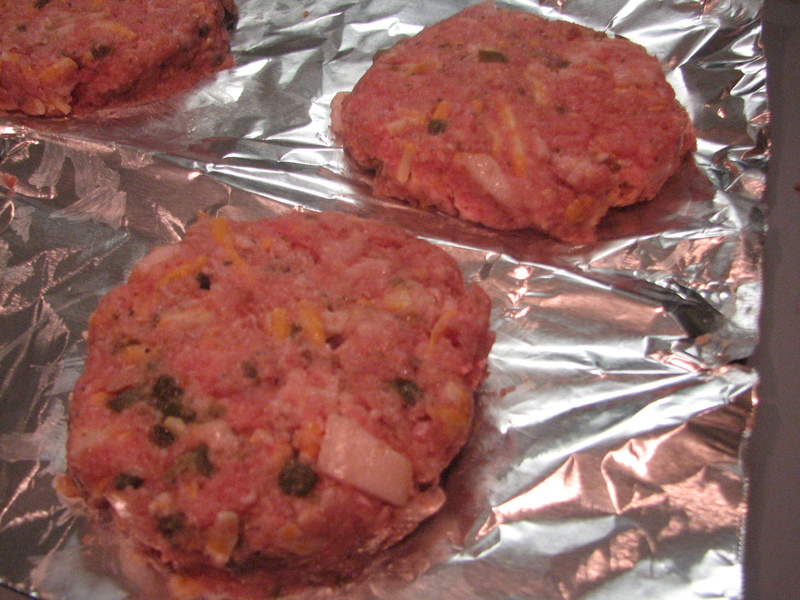 The chopped jalapenos are often in our burgers. And if you’re worried about them being really spicy–they aren’t. 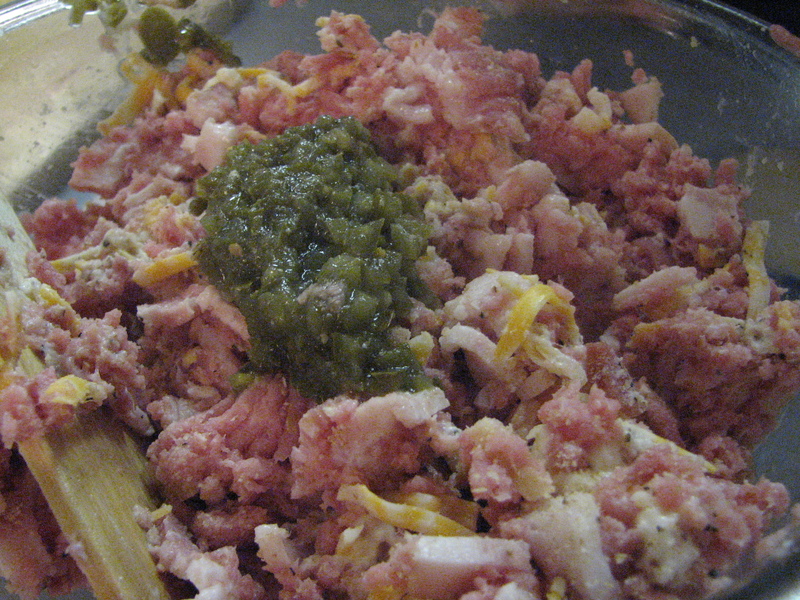 Once the jalapenos are cooked they aren’t spicy at all. I seemed to have planted a seed in Michael’s brain because he really wanted to try it. 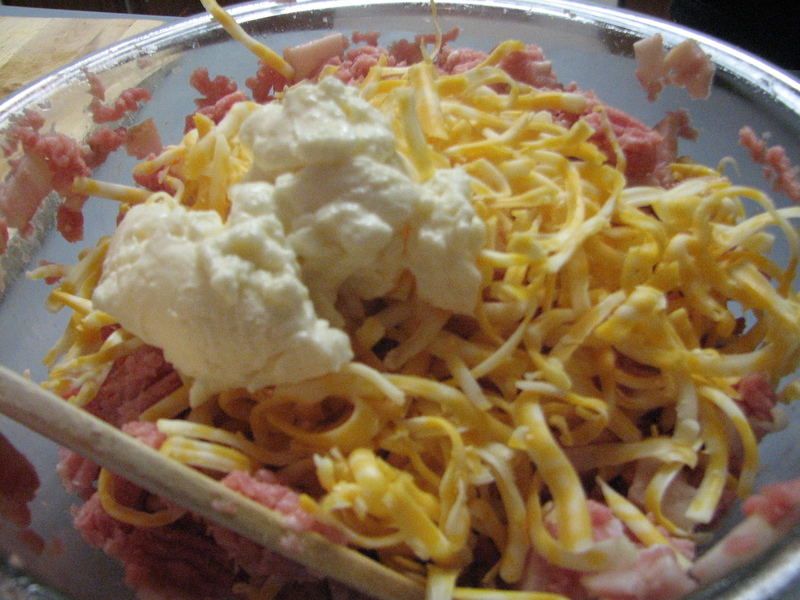 He chopped up uncooked bacon and added it to the turkey burger meat. Michael mixed it all together and then made the patties. He made extras to freeze which help a lot with last minute dinners! 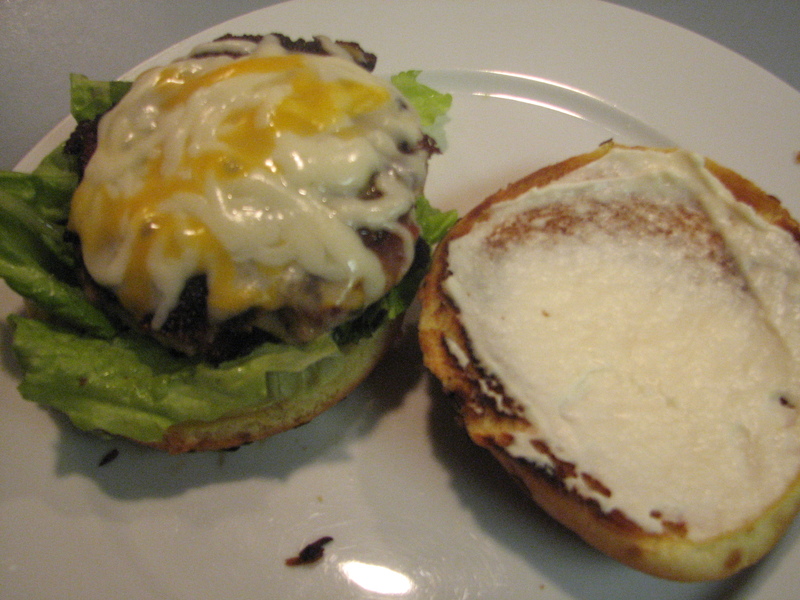 Michael cooked the burgers in the skillet and added some cheese to the top. 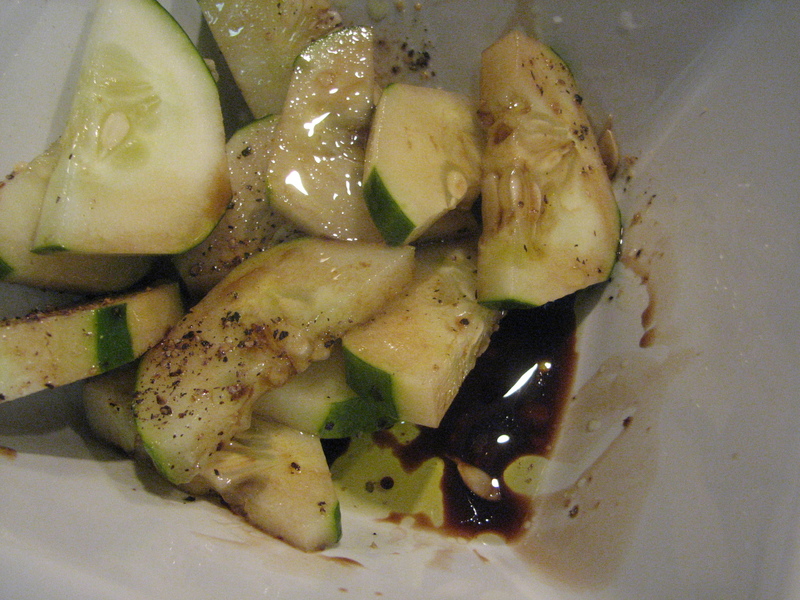 I made a cucumber salad with oil and vinegar. Michael ate his burger on a Sandwich Thin and I had an onion bun. The burger was awesome. It was big, thick, juicy and the bacon added a lot of flavor. Since the bacon wasn’t fried in the skillet ahead of time it wasn’t crunchy in the burger. Instead it just had the bacon flavor. I’m curious how the burgers would be if we cooked the bacon first next time. The bottom line: this variation is a winner! And check out who came out last night! 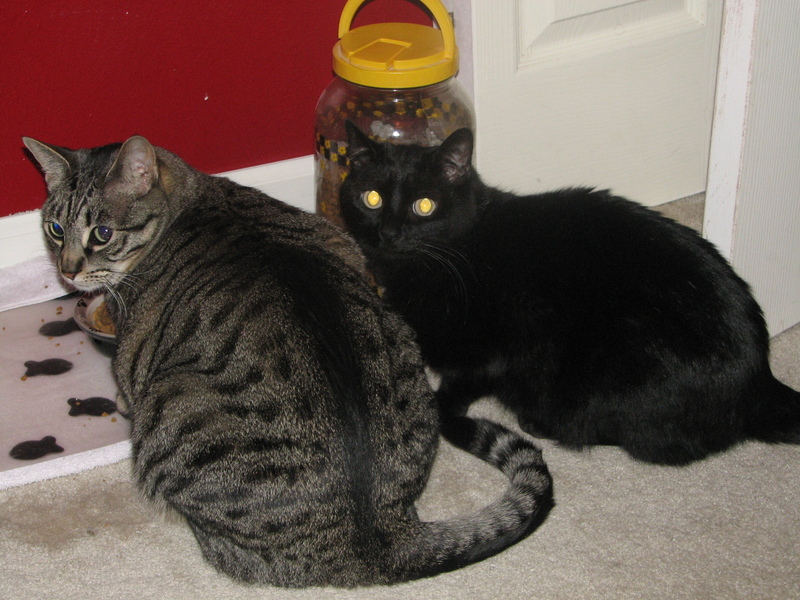 Fat Kitty is on the left and that black phantom next to him is Maya! It’s catching up to me, apparently, too. Every doctor/nurse I saw last week with my injuries asked me first and foremost “How old are you?” Um I’m freakin’ 30. Not old enough to be falling apart, THANK YOU VERY MUCH. It was really annoying and quite insulting. QUESTION: How old are you and how old do you FEEL? Tell me something that makes you feel younger. For a solid decade people thought I was 18. (13-23). The part where people know I’m an adult and not a high schooler finally makes me feel super old. Which I know is silly, but I had a LONG time of looking 18. It was hard to realize it’s over. 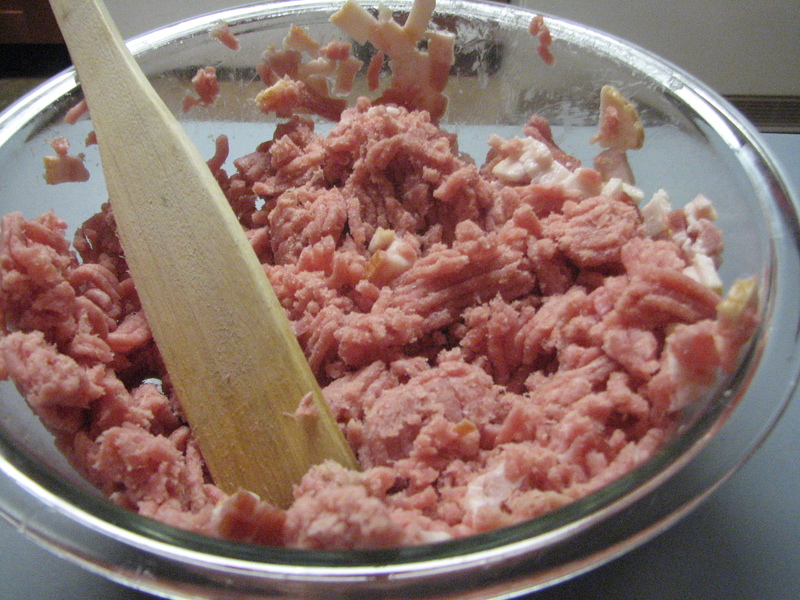 My husband totally wants a meat grinder to make our own burgers-with bits of bacon in them! I’ve never heard of a meat grinder! 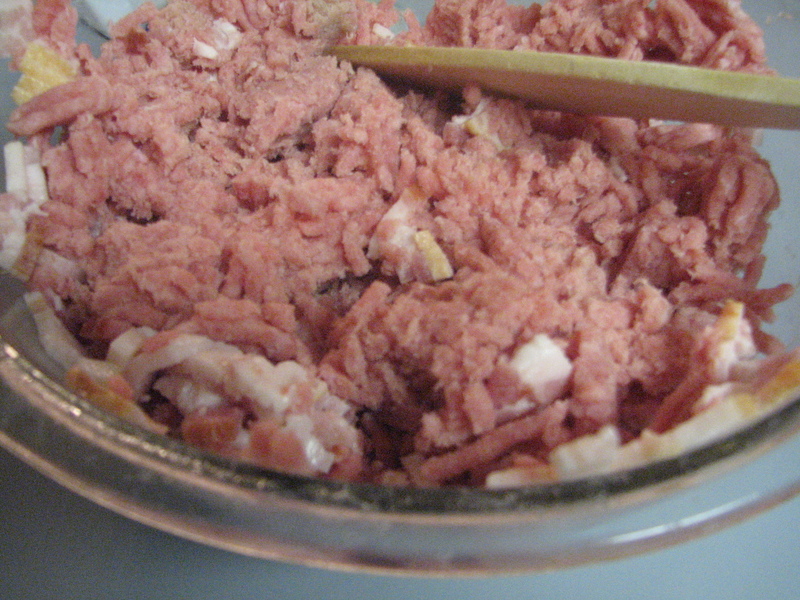 Would a food processor work? We just use our hands. you can kinda do it in a food processor i think though-i saw something in cooking light this summer about that i think? 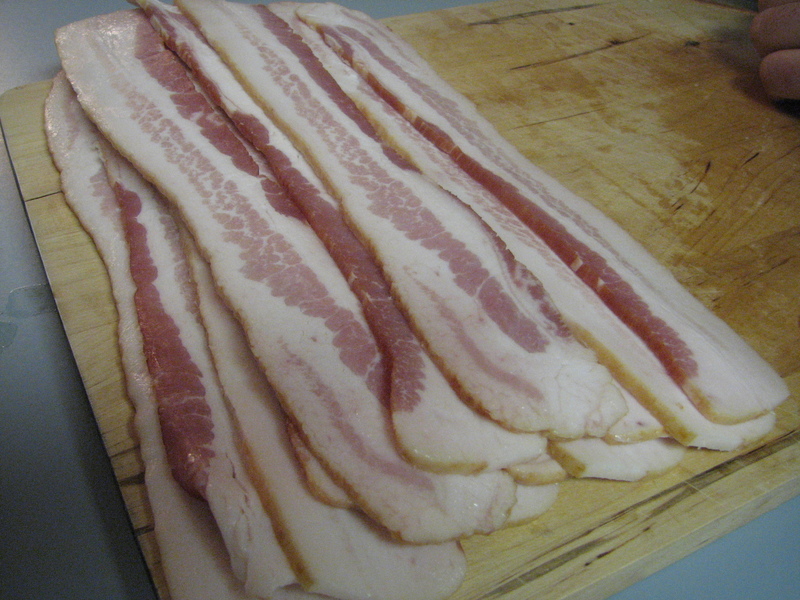 Instead of revealing my age, I will reveal my awesome bacon cooking secret: I cut the bacon in half and lay the pieces out on cookie sheets. Put them in the oven, set the temp to 375 and the timer to 20 mins. When the timer’s done, the bacon’s done. (The original directions said 400 degrees but that was too hot for our oven) This is a great easy way to make a lot of bacon at once. It’s not so fun cleaning the baking sheets (you can lay down foil first if you want) , but it’s worth it! Where do you get your onion buns from?! They look so good! I got them at Fred Meyer. I can look at the brand tonight. They are REALLY good and not high in calories (surprising). Oh that would be great….Thanks! I live in NY and don’t have a Fred Meyer’s by me so hopefully I can get them by me! I now have a serious burger cravinG! Yum! I have to make these burgers!! 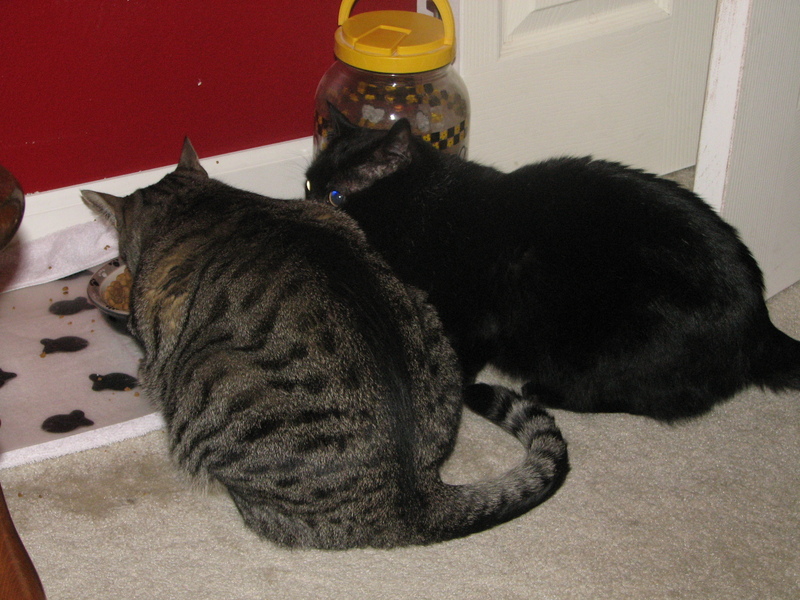 I have 2 kitties too and they’re both getting on (both are 12). One has definitely gained a whole lot of weight, the other has the opposite problem and I can’t seem to keep the weight on him! Well I suppose I am glad I’m not the only one feeling old and broken. 😉 But I don’t even have kids!!! I’m 28, but I feel a lot older at times – especially when I deal with doctors who are younger than me! Something to make you feel young? Morgan Freeman didn’t start acting until he was 34. Ruth “DJ Mamy” Flowers was 65 when she started DJing and has taken the French club scene by storm.